If you’ve followed me for a while here, you’ll know that I always say I don’t knit gifts very often unless a friend or family member expressly asks. I love it when people do ask, but I’m just not a knitter who enjoys surprising others with knitted items very often. What can I say? I’m so weird! In any case, I always into the holiday season blissfully knitting on whatever I want. I do, however, inevitably choose a few small things at the very last moment to knit up for gifts. Why do I do this to myself? I have no idea. You’d think this would be insanely stressful, but after one tense year of trying to finish socks for my hubby on time, now I have a very strict no stress policy. I knit to unwind and while I do indeed put in extra time for a few small holiday gifts, I’m a firm believer that what gets done, gets done, and what doesn’t, doesn’t. End of story. So I did some stash diving and pulled out some sweater yarn leftovers. 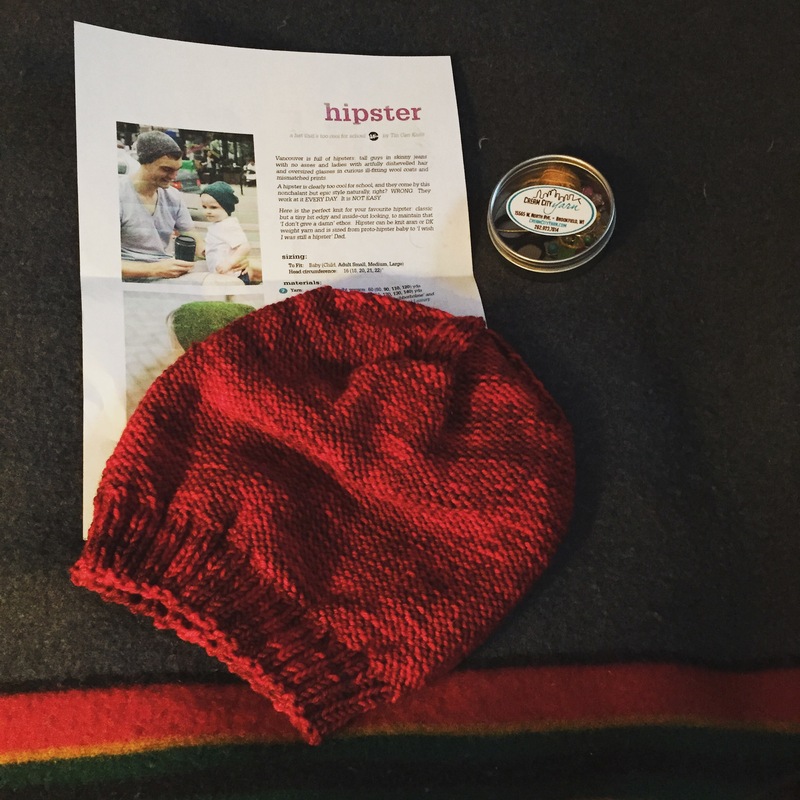 Yes, a Hipster Hat (taking advantage of one of the 12 Days of Christmas free pattern offerings from Tin Can Knits) in Tanis Fiber Arts’ Green Label in the Poppy colorway for my red-loving son. And I finished it today. I have one more skein of this yarnwhich I’ve dog-eared for a Cabled Canuck for me. I can’t have too many red hats. That’s a fact. I’ve been seeing the hashtag #christmasevecaston a lot lately and it got me thinking that I should cast-on an extra special project on Christmas Eve. Luckily, I have just the extra special project! It arrived on my doorstep a couple weeks ago and I’ve been waiting for just the perfect time to share with you and cast-on. 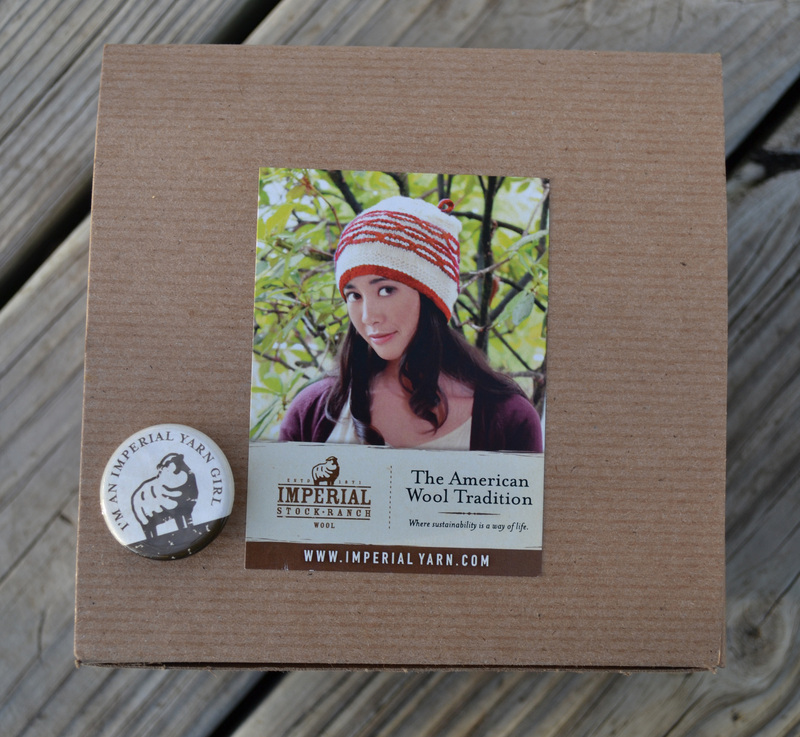 My very first Imperial Yarns in a very cute hat kit. I can attest to that. The single ply yarn ‘Tempest’ included in the Chain Stitch Slouchy Hat Kit is easily the softest American wool I’ve touched. This single is available only in this kit at this time and – wow — is it ever something special! This hat is part of a new collection designed by Deborah Newton just for Imperial Yarns and I’ll be participating in the Deborah Newton Collection KAL. You can check out the list of eligible patterns here. The designer is an active participant in this KAL and she’s available for questions. Plus there will be a pretty sweet grand prize for those who take part, so if you’re interested I’d love it if you could join us. The KAL runs through January 31, 2016, so there is ample time to hop on board and treat yourself to some of this gorgeous American wool. Now logically I know I’m just one hat and a few short days away from my super special Christmas Eve Cast On, but as I’m sitting here next to this wool… I won’t lie — it kind of feels like an eternity. My hands have some last minute gift knitting to get done before this treat can reach my needles. I suppose it’s time to keep my eyes on and hands off this prize though, right? Perhaps the wee hours of the morning could involve some secret knitting? No one will know……. Oh yes, indeed, they do! I usually get an hour or so at night, too. Honestly though, when you’re knitting as much I as I do i think it kind of all blends together for others so I can get away with knitting in front of others and people rarely ask what I’m up to – lol! Constant knitting = camouflage! I admire those of you who risk last-minute gift knitting! I am too anxious of a person in general to do that. Instead, I try to start gift knits in January! I don’t knit gifts either. I have in the past but since I have never seen the items actually being used, I have stopped. I do love the idea of a Christmas Eve cast on. Enjoy! 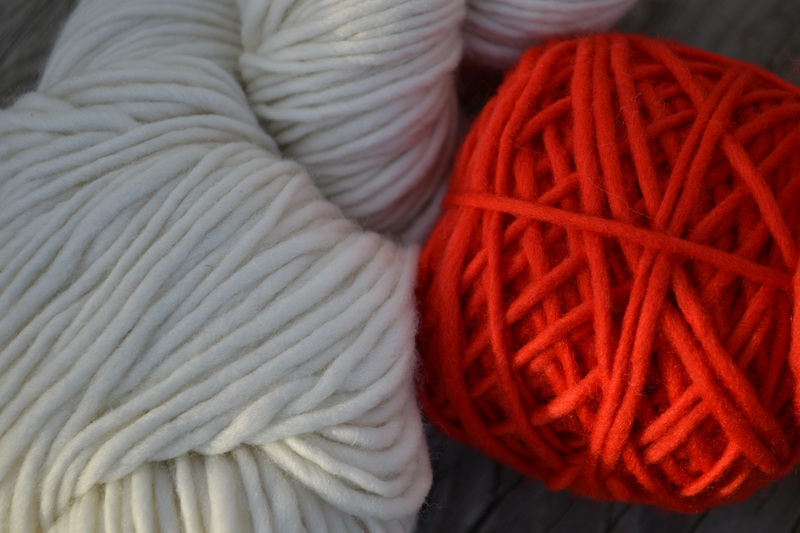 I much prefer to knit on demand for the most part — I think its a more inclusive process. I don’t stress as much about whether or not it will be loved and I enjoy the knitting more.